SWEDEN DEMOCRATS SAY ISLAM IS MOST PROBLEMATIC RELIGION TODAY AND SEEKS DIVORCE FROM IT…….. – The Tundra Tabloids……. 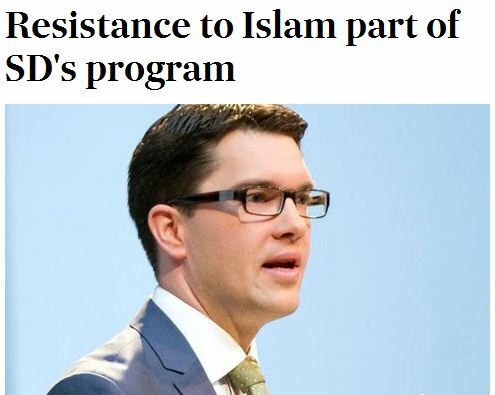 SWEDEN DEMOCRATS SAY ISLAM IS MOST PROBLEMATIC RELIGION TODAY AND SEEKS DIVORCE FROM IT……..
SVD: Sweden Democrats single out Islam as the religion that conflicts most with the Swedish culture. For the first time now writing the party in opposition to its policy program. Party leader Jimmie Åkesson reiterated the aim yesterday, to seriously challenge the Social Democrats and Moderates in the government. This will come with a broadening of the policy and a turn toward the center, where the new policy program and the designation social conservatism are important building blocks. In his speech during the country days Akesson urged the party to be more humble to attract new voters. That’s a big problem for the party that a significant proportion of the electorate that have completely misunderstood our message and are opposed to us, said Akesson. -There is a very sharp value conflict between the Islamic cultural sphere and the West, it is a fact, says Mattias Karlsson. Next Post Next Post NEWS WIRE A.P. PIMPS THE TABLIGH JAMAAT AS ISLAMIC GROUP UNINTERESTED IN POLITICS……. Divorce! At last someone gets it. Divorce or Serparation from Islam and Muslims is the only way to avoid a civil war that will make Bosnia look like a garden party. Sweden needs to rediscover its cultural heritage and restore it as a matter of national pride. I agree that Islam needs to be banned and Muslims who follow it kicked out. I hope these true Swedish patriots gain the upper hand before it is too late.